Weekly Pokemon Broadcasting Station #019: "We Pichu Brothers [The Millennium Town Encounter] and [A Part-Time Job is Difficult Nyasu!?]" Pokémon Chronicles Episode 19: "Of Meowth and Pokémon"
The adventures in Millennium Town, the setting of the mini-movie "Pichu and Pikachu," continue! 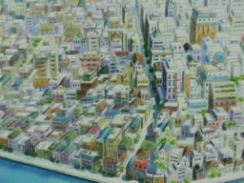 In "The Millennium Town Encounter," Nyasu is walking along one day when he bumps into a Moochul. 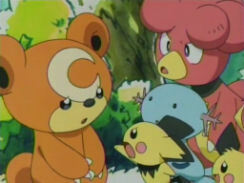 The accident causes the two pokemon to mix up the baskets they were carrying, placing Nyasu's lunch in Moochul's hands! The cat pokemon chases Moochul to its hideout, where the kiss pokemon's friends join together to stop Nyasu. After a frenzied chase, Moochul and its friends discover the truth and decide to help Nyasu get his basket back. After retrieving his basket and being chased by an angry Delvil, Nyasu collapses with exhaustion. In "A Part-Time Job is Difficult Nyasu! ?," Nyasu takes on a part-time job as a pizza delivery pokemon in order to earn the money needed to build a giant golden statue of himself. The cunning pokemon decides to trick the pokemon of Millennium Town into delivering his pizzas for him, but various mishaps cause the pokemon to be unable to complete a single conveyance. Next, Nyasu tries his hand at a job as the cleaner of a large mansion, but the city pokemon's attempts to help Nyasu get him fired a second time. Nyasu gets angry at the pokemon for always getting in his way, but a kind gesture that shows Nyasu how much they care about him quells his anger. Surrounded by pokemon who idolize him, Nyasu ignores his horrible resume and happily accepts their friendship. The Pichu brother short that came packaged with the Entei movie was a fun little adventure, and the fact the anime producers made more adventures featuring shows that they agree. While you have to sort of take the specials as existing in their own little continuity, they're still fun little romps that combine a great soundtrack, amazing backgrounds, and amusing tales about a bunch of little pokemon running around and causing mischief. While I'm not always a fan of the overly sugary sweet shorts, these Nyasu-themed Pichu brothers shorts are different for me for some reason. The dubbed version is surprisingly...bad, actually. I mean, with the way the last few episodes had turned out, I thought this comparison would be on the same level as the fourth episode comparison. 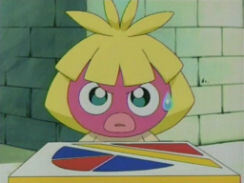 And besides, how much could 4Kids screw up a Pichu Brothers short? Yet for some reason, 4Kids pulls a "Legend of Thunder" on us and makes edit after edit for no apparent reason. The English version of this episode is also being shown waaaaaaay late. It should have aired between "The Blue Badge of Courage" and "Oaknapped!" but for some reason 4Kids decided to hold off on dubbing it until now. This kind of gives Chronicles as a whole a really unbalanced feel since they're pretty much loading all their Pikachu short-type episodes at the end of the series. If you're watching the dub and don't like Pikachu shorts, then 4Kids pretty much allows you to make "The Search for the Legend" the last episode of the series. If I was in charge of the dubbing, I'd probably have spread these out a little more to allow "The Search for the Legend" to be the series finale. For your reference, this episode was released between episodes AG 014, "Double Battle and Double Kemusso!" ("All in a Day's Wurmple") and AG 015, "Study! Pokemon Trainers' School!" ("Gonna Rule The School!"). 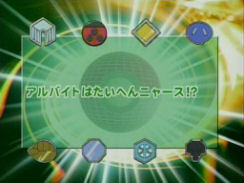 In the Japanese version, Nyasu no Party is used as the episode's ending theme. The Pichu brothers and Upah keep their Japanese voices. If you think the story in this episode seems jumbled and disoriented, there's a reason for that; this was originally two separate episodes. You see, in Japan this episode consisted of two 11-minute shorts: "The Millennium Town Encounter" and "A Part-Time Job is Difficult Nyasu?" Each short had its own title screen, its own self-contained plot, and its own TO BE CONTINUED screen. However, 4Kids decides to combine these two stories to make one long 22-minute episode. I don't really know why because neither story really has anything to do with the other, so why combine them? Since they didn't do it with the two Winter Vacation shorts in Episode 04, so I was quite surprised when they did it with this one. So far, every Chronicles episode except "The Legend of Thunder" Parts 1-3 have at least kept 1% of the Japanese music. This episode isn't one of them; there isn't a single piece of music left over from the Japanese version. It's a shame, too, because these two shorts use that jazzy music from the "Pikachu and Pichu" short instead of the regular episode music, making this episode stand out more. The opening shots of the episode -- basically everything before the title screen -- is removed from the dub. This missing footage consists of various establishing shots of Millennium Town as the narrator tells us about the little pokemon who live in this big, big city. Click here to see more images from this scene. The biggest edit to this episode, by far, has to be the script. Every other Chronicles episodes take some liberties with the script, fudging a line here and there, but they've at least managed to keep the gist of a large portion of the dialogue. But this episode is different. The only lines in this episode that are actually translated correctly are the two lines or so where Meowth talks about wanting to build a giant golden statue of himself. Everything else? Well, everything else is a complete and total rewrite. Basically, what 4Kids does is make Meowth the narrator of the episode, meaning everything we hear is from his perspective. Meowth starts off by going on about how he's always looked out for himself and how he is able to get his chump pokemon pals to do his bidding. Later (because of the episode merging), Meowth starts to randomly go on about how he needs money and how clever and seems to drop the whole "only look out for yourself" schtick he was going for. None of this, by the way, is in the Japanese version. 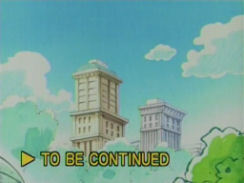 In the Japanese version, the narrator actually carries the weight of the episode. Nyasu still has all his dialogue, of course, but everything else is a one-man performance by Mr. Narrator. He tells us what's going on and provides voiceovers for all the non-Nyasu pokemon in the special. You know how in Meowth's boss fantasies, Meowth will kind of do his impersonation of Giovanni? Well, the narrator in the Japanese version does the same thing here; this time, however, he does it for every pokemon in the episode. Moochul gets a girlish voice, the older Pichu brother gets a sort of older mentor-type voice, Buby gets a sort of nerdy voice, etc. It sounds like it would be lame as hell, but it's actually quite amusing to listen to. Mike Pollock got absolutely robbed of what could have been his most entertaining performance, and I hope if Japan makes more of these, PUSA or whoever's dubbing it will return the narrator's lines to where they belong. Two seconds are trimmed from the shot between Himeguma's first appearance and Marilli's first appearance. Three seconds are removed from the shot where Marilli calls everyone for breakfast. The overhead shot of everyone gathering from various parts of the wood into the area where Marilli is waiting is shortened by a second. A second is removed from the shot of the pokemon looking sad after seeing their acorns crushed by the passing truck. After that, a long 22-second cut is made. 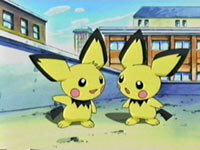 Basically, one of the Pichu brothers starts yelling at Himeguma, blaming it for ruining their meal. The younger Pichu brother pouts, and everyone starts to laugh as the narrator tells us that the pokemon have forgiven it. As Meowth is looking over the city with his coffee cup in paw, the sound of police sirens that was present in the Japanese version is missing from the dub. The shot of Meowth with his back to the camera ("...and everyone will know how truly great I am!") is three seconds longer in the Japanese version than it is in the dub. The letters REW (for "rewind") are taken away from Nyasu's flashback. A second is trimmed from the shot of Moochul running away from Nyasu at full speed. 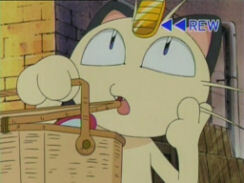 Later, an 18 second scene during which Moochul realizes that the basket it has belongs to Nyasu is excised from the dub. Originally, after Nyasu rushes over the fence to get his basket, Moochul looks down, sees its basket full of make-up, and then has a flashback to when it bumped into Nyasu. That footage is replayed, and then we go back to seeing Moochul and the others with a sort of apologetic look on their faces. 4Kids plays the shot of Nyasu stepping on Delvil's face twice, while it's only played once in the Japanese version. 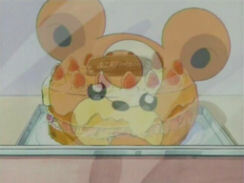 A five second shot of Himeguma looking at a cake before being hit in the head with Nyasu's picnic basket is removed. Later, three seconds are removed from everyone's reaction to seeing Nyasu all beaten up and bruised. Finally, the last sixteen seconds of the first short are removed. This includes another reaction shot from the pokemon, a wide shot of Nyasu, and a shot of the city with the words TO BE CONTINUED on it. 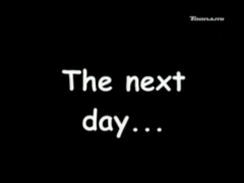 4Kids combines the two episodes together by adding this "The next day..." screen in between the two shorts. This, of course, is not in the Japanese version. 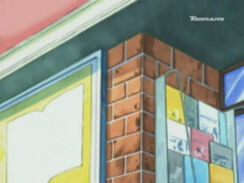 By the way, you gotta applaud 4Kids for their use of the über-classy Comic Sans MS font. A lot of the signs in the city get their English painted away. I'll post some pictures here, but if you want to see all of them, click on this page. The text "Bar at O'Henry's" is erased from a sign in the background. "Burgers" is erased from the poster with a burger on it. I think this one's my favorite. I wonder if the inside of the books inside are as blank as the signs up front. The poster Nyasu looks at gets altered too. 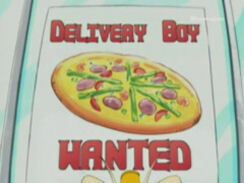 Gotta love 4Kids' use of the outdated term "Delivery Boy." 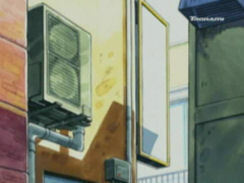 The title screen for the second story is removed, and the first shot of Nyasu in his new pizza delivery outfit is shortened by a second. This is probably the most obvious edit in the episode due to the awkward transition between the shot of the poster and the shot of Nyasu. 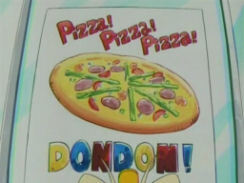 The shot of Moochul backing up from the gang of Zenigame as they try to take its pizza is shortened by three seconds. An eight second shot of Moochul backing up again followed by the Zenigame putting their hands together is removed from the dub. 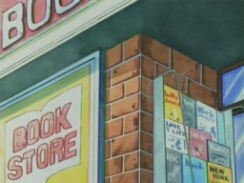 Some Japanese text (翁樺楼, which roughly translates to "old birch") is erased from this sign during Himeguma's delivery. I think this is the first actual Japanese text cover-up we've gotten since "Jirachi Wish Maker." A second is trimmed from the shot of Buby's fire burning the rope during Nyasu's cleaning job. In the original version of this episode, we see the shot of Nyasu crying because of how happy he is to be admired. 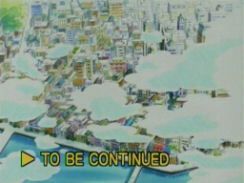 Then, the camera pans up to show us the city's landscape and the words TO BE CONTINUED appear on the bottom. In the dub, the shot of Nyasu crying is looped over and over to get rid of this pan-up (and, of course, the TO BE CONTINUED text). Kind of a random way to end the episode, if you ask me.